Spring is nearing every day and you know what that means - baby season! It's not really the season for babies, but family activity here in SLO grows with the warmer weather and sunshine. I love walking around at the Farmer's Market and seeing happy little faces peering out in every direction I look. 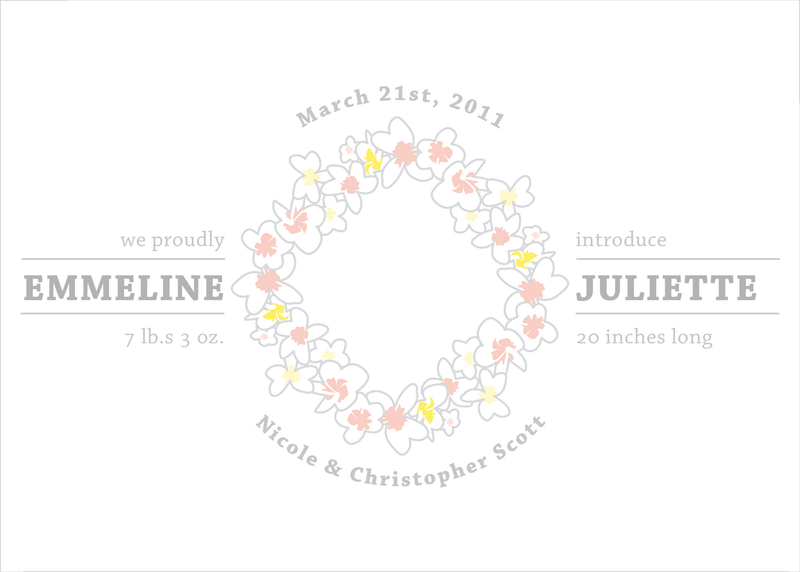 Designing baby announcements if very enjoyable, but equally challenging. Most parent's have an idea of how they want to introduce the world to their little one. If you know some expecting parents, send them my way! I'd love to help them welcome their new addition with some paper goods! Above is a proof I recently sent to some very special people. The information has been changed for their privacy. 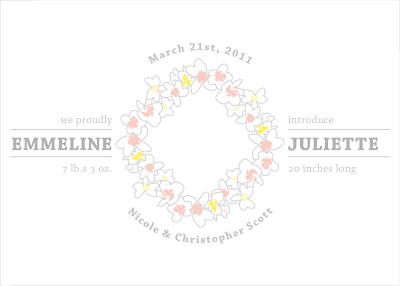 The design of the plumeria wreath is soft, gentle, and easily modified for each unique family; colors can be changed, typeface can be changed, flowers can be changed, but the basic layout is able to remain the same. It's been designed to be able to be paired with a 4"x6" photo (or another printed piece) and sent in a standard sized envelope. Envelope liners are another great way to invest in the introduction - they add a bit of interest and tie the pieces together.